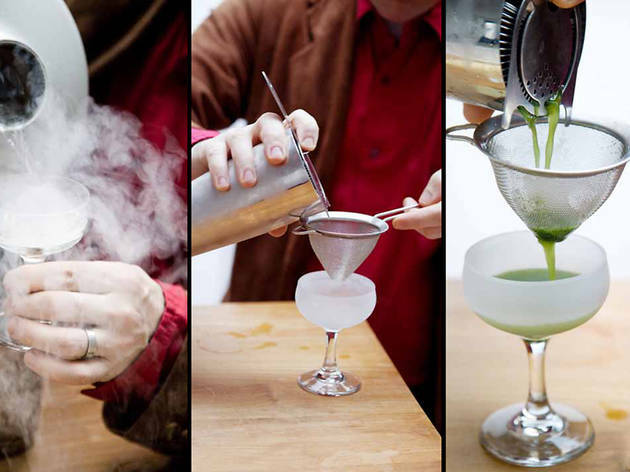 Centrifuges, rotary evaporators, red-hot pokers: this isn't your average bartending demonstration. 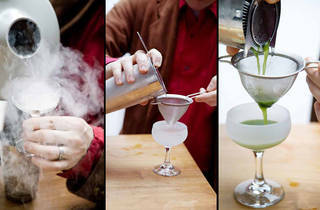 Dave Arnold – director of culinary technology at the International Culinary Center and the brains behind recently opened New York bar Booker and Dax – brings a laboratory aesthetic to the art of cocktail making. Champagne flutes are flushed with liquid nitrogen, chilling the inside of the glass without freezing the stem. Bananas and aged Ron Zacapa rum are blended with a pectic enzyme, then spun in a centrifuge for five minutes to produce a clear liquid. A mix of Hennessy cognac, pineapple ale and lemon juice is heated with a poker – reviving a technique that went out of style before the Civil War. You can sample some of these high-tech tipples at the Park Hyatt Tokyo's New York Bar this week, where Arnold will be doing a four-night residency. The drink menu includes his vivid green Thai Basil Daiquiri, where the herbs are muddled with liquid nitrogen in order to retain their colour and freshness, or his Peony Grape Kindai Surprise, a carbonated mix of Belvedere and fruit juice that you'd swear was made with champagne. 'Hopefully nothing were doing is a gimmick,' says Arnold. 'I like things that are very simple, I like things that are very clean.' He'd better watch where he puts that poker, then.